What is Gallery Magick Image Processing? org.onehippo.forge.gallerymagick.core.command.ScalrProcessorUtils utility class provides a pure Java based image identifying/resizing solution. Gallery Magick Image Processing Core Library : Programmatic Utilities to process image files using imgscalr - Java Image-Scaling Library, GraphicsMagick, or ImageMagick. Gallery Magick Image Processing CMS Plugins : Hippo CMS Plugins such as Magick Command Gallery Processor using Gallery Image Processing Core Library. When images are uploaded through Gallery Magick Image Processing CMS Plugins, the plugin will extract all the image metadata automatically (through identify -verbose command internally) and store the result metadata string in gallerymagick.metadata (string) property at the hippogallery:imageset node (the parent node of all the image variant nodes such as hippogallery:original or hippogallery:thumbnail). The code of this project is on GitHub at https://github.com/bloomreach-forge/gallery-magick/. 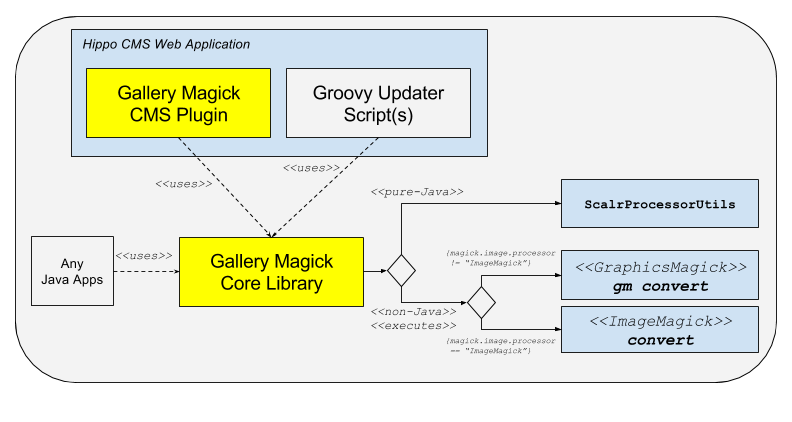 There is a demo submodule in which you can build and run a demo application, which configures Magick Command Gallery Processor Plugin. Visit http://localhost:8080/cms/, move to the "Content" perspective and select "Images". 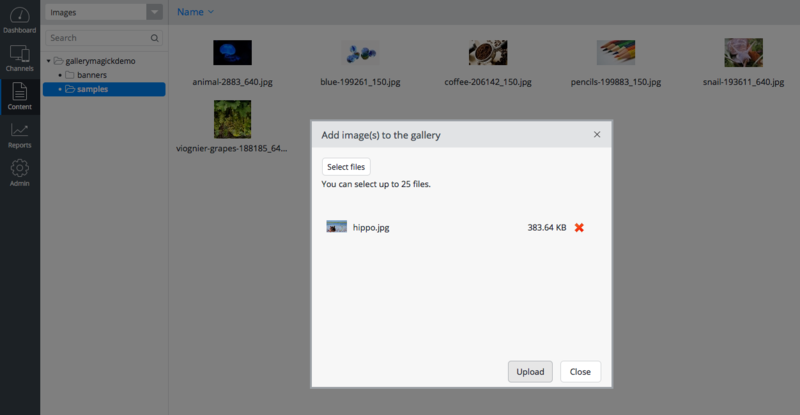 And select a folder and try to upload an image. If you click on the "Upload" button, you will see the image being uploaded. You don't see anything new yet. :-) It's basically working like how the default Gallery Processor works, so the functionally is almost the same. However, if you take a look at the logs (the demo project is configured to leave logs in DEBUG level for the plugin related code by default), you will see clues about how the plugin works under the hood! Note: the log data shown above were minified for readability. Basically, when either of the non-Java based solution, the plugin copies the original image data to a temporary file and resizes the temporary file of the original image for a thumbnail image by executing commands of either GraphicsMagick or ImageMagick. After executing the commands, it deletes all the temporary files. 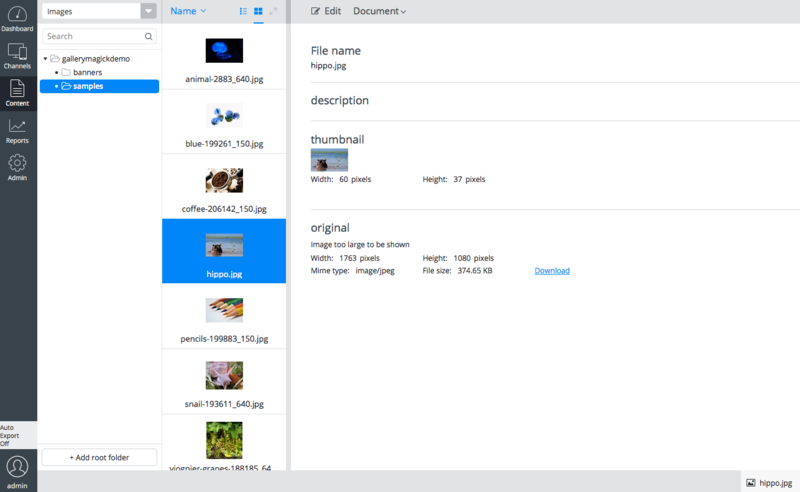 Also, try to crop and restore thumbnails in the CMS UI to get more clues.